When Horrible News Hits Our Feeds, Some Can't Bear To Watch : All Tech Considered When images and video of violent incidents like the attack in Nice, France, saturate the news and social media, many people feel overwhelmed and just want to turn away. 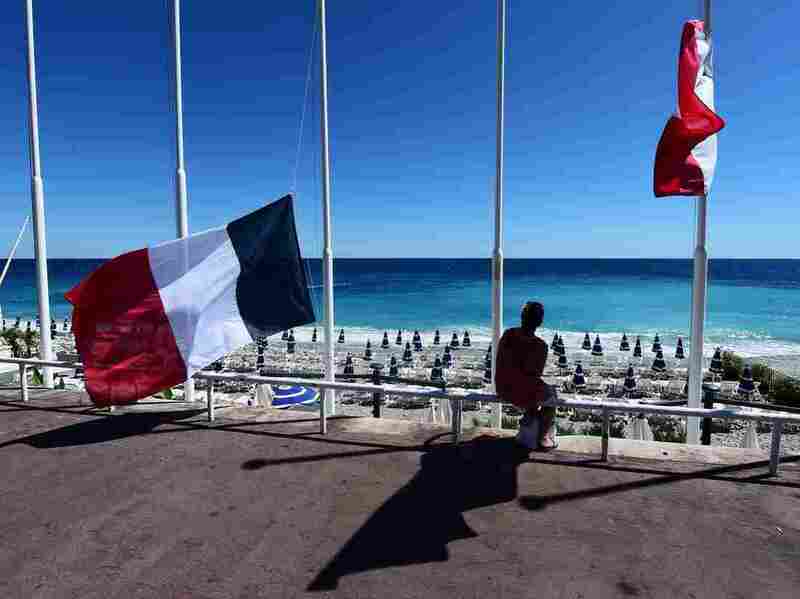 A woman sits under French flags lowered at half-mast in Nice on Friday following the deadly Bastille Day attacks. Our world shares today much of what would be inaccessible if not for our unprecedented interconnectedness. We share car rides using smartphone apps. We share our spare rooms with strangers who don't simply want to be tourists in a new city. We share videos and photos of our good times and our bad — especially when our bad times include violent images and photos of people being attacked or killed. Since Thursday night's attack in Nice, France, during Bastille Day celebrations, social and mass media outlets have been saturated with the images and video clips of bodies and of people running in streets and with the sounds of screams and gunshots. Many of these appear in feeds where a video may begin playing automatically, or the sound may activate by simply hovering your mouse over the video. While some of these posts contain disclaimers — "Warning graphic content" or "Warning: distressing" — for many these horrific images are too much. There is footage of those people dying in #Nice. Don't watch - for these peoples' dignity and because those who did this want us to see it. why are you showing this !!!??? As David Sipress' popular illustration puts it, "My desire to be well-informed is currently at odds with my desire to remain sane." Some on Twitter say such incidents are not to be ignored. At least 75 people died today in Nice, France during a Bastille Day celebration. This is not a time to ignore the news, but a time to pray. Deborah Sosin, an author and clinical social worker, wrote about this phenomenon for member station WBUR. She says that often, when events like the attack in France happen, the media is flooded by content that saddens and angers and triggers unwelcome personal memories. It's shared without regard for an audience that may not solicit it, and in some cases it can traumatize. Sosin says that's not OK.
Sosin says it is OK to "tune out" while the media goes into a frenzy. "I am saturated. I am traumatized. I can't watch anymore." Justina Vasquez is a business desk intern.